There is an alarming amount of misinformation and confusion about the use of mobile phones and texting while you’re driving. It is important that you equip yourself and your youthful drivers with a clear picture of the affects of this driver distraction phenomena. We all know it’s a disturbing trend on the roads now but, a Virginia Tech Transportation Institute Study provides us with risk estimates that should get your attention. Below is a summary but, know that text messaging on a mobile phone can increase the risk of a crash or a near-crash event by 23.2 times over non-distracted driving. > Talking or listening to a cell phone made the risk of a crash or a near-crash event 1.3 times as high as non-distracted driving. > Reaching for an object such as an electronic device made the risk of a crash or a near-crash event 1.4 times as high as non-distracted driving. 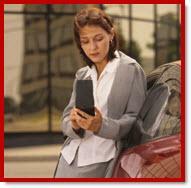 > Text messaging made the risk of crash or near-crash event 23.2 times as high as non-distracted driving. The bottom line is that driving is a visual task and any non-driving activity that takes your eyes away from the road is a bad thing. We have saved many clients hundreds of dollars on their auto insurance in Florida. Call or text me (Just not while you’re driving) or get a free online quote.